An eye level view of the surface of an electric guitar. 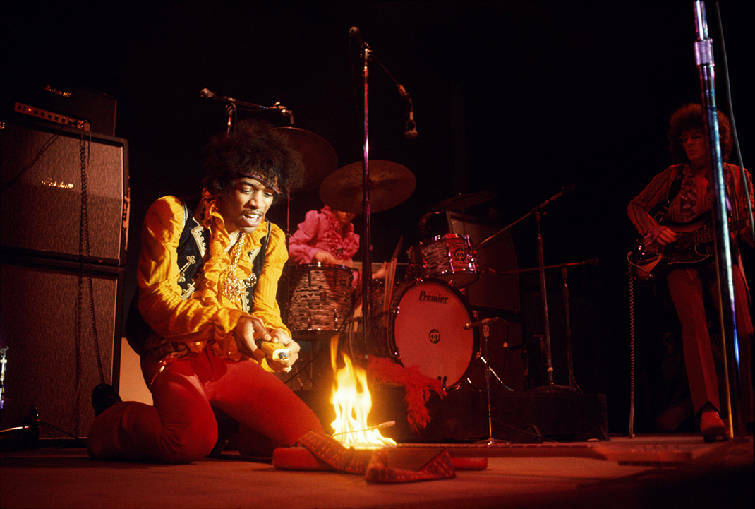 Jimi Hendrix burns his Fender Stratocaster &mdash; or the one he switched out with his own, rather &mdash; at the Monterey International Pop Festival in 1967. He set his guitar aflame. The stunt, immortalized on the cover of Rolling Stone, won the young artist the nation's attention, but it also helped to save what is now considered history's most popular electric guitar from extinction. The guitar he torched — then subsequently smashed to pieces — was a Fender Stratocaster, and Hendrix could make that bird sing higher and sweeter than any other musician before him. Artists who made the "Strat" their instrument of choice, such as Hendrix, Bob Dylan and Eric Clapton, sent thousands running to stores to purchase a guitar whose production had been reduced due to a lull in popularity. 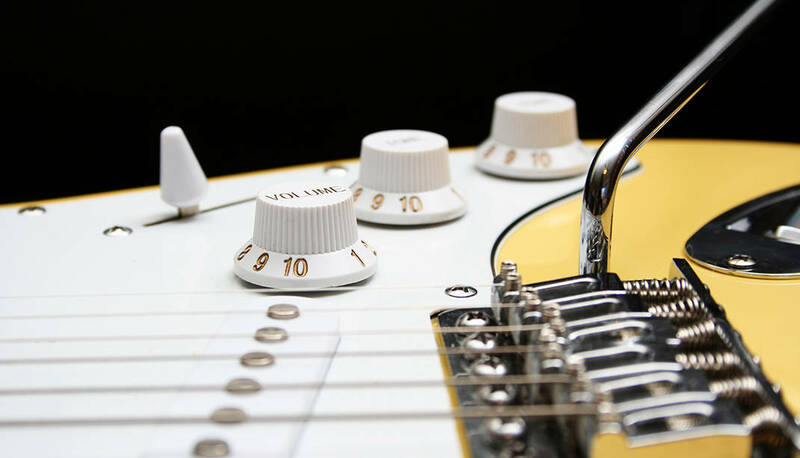 By 1969, the Strat was a top-seller, and its dual-horned design was on its way to becoming the most copied of all time. Songbirds boasts a large custom-color collection of Fender guitars &mdash; a complete rainbow of color. But those glory days of rock have passed, and while the guitars of old are still just as impressive as they were at their peak, the icons who once thrust them into the spotlight have all but disappeared. That's why Songbirds Guitar Museum has taken on the responsibility of preserving timeless guitars like the Stratocaster while inspiring the next generation to savor the craftsmanship of an age not yet forgotten. Every instrument has a story to tell, and Songbirds Guitar Museum has been inviting all to hear the tales its guitars recount since opening in the Chattanooga Choo Choo complex on March 10. 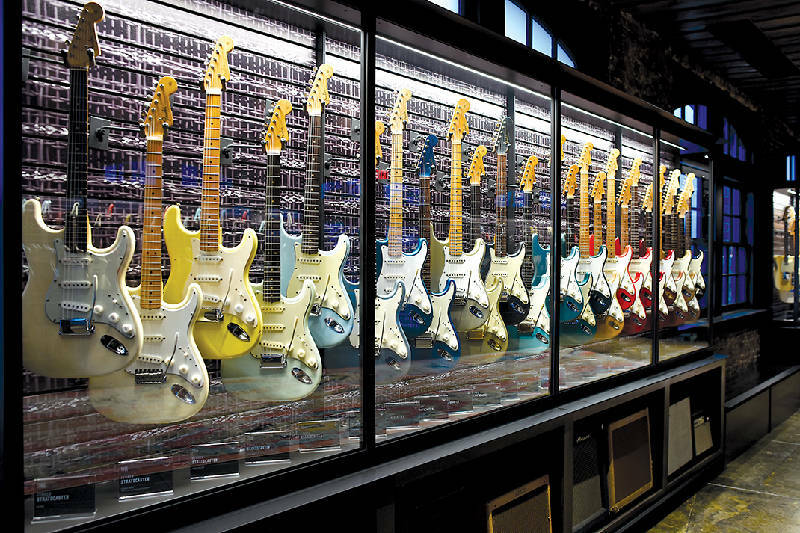 The pop culture museum houses the largest private collection of rare and vintage guitars in the world, with 550 on display at any given time and a total of 2,000 (and counting) currently in its possession. Visitors can tour the exhibits to get a full picture of the guitar's evolution from the 1920s to the 1970s, but the most captivating part of the experience for many is learning what each individual instrument has witnessed and all the places each has been. Before finding a place in the collection, many of the guitars were dragged from bar to bar, concert to concert and studio to studio with little thought about the value they would one day hold, says David Davidson, museum curator and chief operating officer. They had beers spilled on them and drinks rested on them, were dropped, battered and bruised. But save for a few battle scars, the sturdily built guitars, many now more than 50 years old, have seen it all and survived. "They're a living testament to the durability and the quality of the craftsmanship and workmanship of the American worker during the golden age of vintage guitar building," Davidson says of the pre-1970 guitar industry, before cheaper wood and machine manufacturing robbed the world of such masterpieces. Several of the guitars have been strummed to life by famous hands of yesteryear — from early country-western artists to jazz musicians to rock idols. Others were handled only by small-town dreamers, nameless garage band rockers and casual music-lovers who never made it home from Vietnam. But all carry the stories of these unique people and places, and Songbirds is now part of that story. Here is just a sample of the stories the museum's rarest guitars have to sing. The Songbirds sing to preserve a legacy. For some, vintage guitars are more than just relics of a nearly forgotten age of music. They're a final connection to loved ones lost. Guitars imbued with such sentiment are often the hardest to ask families to part with, Davidson says. But few were as difficult to acquire as the twin Telecasters permanently displayed in the museum's ever-changing collection. The instruments belonged to twin sisters Bertha and Esther Friedlich, members of a now little-known band called the Tweedledees. When the duo traveled to Santa Ana, California, to buy guitars from Fender Sales Inc. in the late 1950s, they were presented with a left-handed and right-handed Telecaster to match their individual preferences. Esther, the thinner of the two, was happy with the left-handed guitar she tested, but her heavy-set sister was miserable. The right-handed guitar she sampled was too heavy and didn't fit her body well, she told sales representative Don Randall — the marketing mastermind who named the Stratocaster and helped bring Fender to fame. Randall brought the problem to George Fullerton, vice president of production, who was somehow able to convince company founder Leo Fender to craft a special guitar, a feat in and of itself since Fender was notorious for never wanting to make anything custom for anyone. "He figured if he did it once, he'd have to do it for everyone," Davidson explains, adding that would mean buying more materials, hiring more employees and building more than one spray booth to meet the resulting demand for variety. Fender begrudgingly fashioned a guitar for Bertha with an arm contour and a body cut to fit her frame. The modifications took 2 and a half pounds off the instrument and thrilled the young woman, who went on to play for her band, which was signed by a label but never recorded. Her Telecaster became the only early model in existence with that cut — the company made sure of it. Fullerton was even required to sign an agreement stating he would never ask for such modifications to be made again, Davidson says. "That's a pretty interesting story. But that's not the story," he promises. "It gets better." When Davidson learned of a left-handed, three-tone guitar about five years ago, he traveled to Clear Lake, Iowa, to meet up with an elderly Esther, who was ready to sell. After the transaction, she mentioned her late sister's guitar and told the guitar buyer it was special. Intrigued, Davidson reached out to Bertha's daughter, Anne, to ask about it. The first words out of her mouth were, "It's not for sale." The guitar was her mother's, she told Davidson, and though she was hesitant, he convinced her to at least let him take a picture of the twin guitars side by side. The two met up in Anne's home outside Boulder, Colorado, and sat at the dining room table. When Anne opened the case, Davidson nearly lost his mind. "I just absolutely freaked," he remembers. "I had never seen a guitar cut like that." He immediately tried to buy the instrument from her, and she immediately said no. The guitar was her mother's, she repeated, holding her ground even after Davidson pulled out a knapsack filled with $100 bills. "No joke," Davidson interjects. "These guitars are expensive. You could buy houses for the prices of these guitars." The collector went home empty-handed yet determined to get his hands on Bertha's old guitar. He sent Anne a Christmas card at the end of the year and for every year that followed. Each card held only his phone number and a short message: "Call me last." It was his way of promising he'd pay the highest price whenever she was ready to sell. After three years of Christmas cards, Davidson got a call from Anne, who wanted to know what would happen if she sold him her mother's guitar. She was worried the instrument would just be passed from one buyer to another and that her mother's legacy would completely disappear, so Davidson pitched an alternative. He told her he was building a museum in Chattanooga, Tennessee, with a vault that would house the most historic guitars of all time. Then he promised that if she sold him the instrument, he would give both Friedlich sisters' Telecasters permanent residence in that vault and tell every single person who tours it the story of her mother, her aunt and what it took to get their guitars. Finally, she agreed, but when Davidson asked her how much she wanted for the instrument, she surprised him. "You can have the guitar," she said. She was only interested in preserving her mother's legacy. And so far, Davidson has. The twin Telecasters have their own special case in The Vault, and every staff member learns the story of Bertha and Esther Friedlich so they can pass it on to visitors. "Sometimes it's all about dollars and cents. If you pay them enough, they'll sell it," Davidson says of buying guitars. "But for some people, there's not enough money in the world." The Songbirds sing to celebrate ingenuity. Guitars like the EB2 Tenor Electric would have never been found in any catalog. That's because one-of-a-kind variants like it weren't made on assembly lines during regularly scheduled business hours. They were built in secret after the lights were shut off, the boss went home and history's anonymous craftsmen were left free to let their imaginations run wild. They toiled through the night, building guitars with ridiculous or masterful designs just to see if it was possible. This EB2 has earned a place as one of Davidson's favorites in part because of its whimsical nature. The instrument has the large body of a bass guitar, but it is paired with the slim, tiny neck of a tenor guitar. From the looks of it, the seemingly disproportionate guitar should have fallen apart years ago. "[It's] almost like a spoof," Davidson says with a grin, "like a joke." But the concept is nowhere near as impressive as the design behind it. Despite the apparent maldistribution of weight, the guitar is well balanced by various elements in its makeup, such as a special cut-down bridge built to accommodate the four pole pieces (for four strings) on a guitar that would normally have six. "Somebody really took their time," Davidson says. "This is major engineering. It's like a feat to make this guitar." The EB2, like many other variant creations, never graced the fingers of stars. In fact, it was probably barely played, Davidson says. Its creator, whose name has been lost to history, simply built it to see if he could, and that ingenuity has landed his handiwork a spot among the rarest guitars in the world. The Songbirds sing to share a history. When most people think of electric guitars, they picture the vibrant splash of colors that became standardized in the 1960s. But the first custom-colored guitar Fender ever built was not a bold shade of red or an electric burst of blue; it was a cream-colored white. And it was spectacular. Songbirds has already seen visitors flying in from all around the U.S., Canada and the United Kingdom, but Davidson is hoping the museum will attract more locals as it continues to make Chattanooga its home. With a collection vintage guitar aficionados travel halfway across the globe to see, the masterminds behind Songbirds could have established the museum anywhere, but Davidson says they chose Chattanooga because they wanted to help facilitate the city’s growth. Davidson, who has been traveling to and from Chattanooga for business for 15 years, says he has seen the improvements local leaders and business owners have made to the city over the last five years alone, and he hopes the museum will help push the city even further toward its goals. The museum contracted local companies like building design company Range Projects and architectural firm Cogent Studio to build out the space, and Davidson hopes to continue to support local business by drawing tourists to the Southside and its mom-and-pop restaurants and shops. He invites locals to help support the museum in turn by coming out to visit its rotating and permanent collections featuring a little something for everyone. Monday-Wednesday, 10 a.m. to 6 p.m.
Thursday-Saturday, 10 a.m. to 8 p.m. In 1951, a custom color for the young company was anything that diverted from the standard honey blonde, but it wasn't just the shade that made this guitar eye-catching. The Olympic White instrument sported gold-plated hardware and a clear pickguard varnished with gold leaf paint. The beauty now in Songbirds' collection landed in the lucky hands of swing jazz artist Oscar Moore, who played alongside Nat King Cole before the latter became one of the first African-Americans to host a national television variety program, "The Nat King Cole Show." Some speculate that Leo Fender presented the guitar to Moore during a push to make his instruments seen in the hands of performers from many genres of music, and the gold plating may have been a lure for Moore since the style was more common in the archtop guitars favored by jazz players. The most interesting part of this tale, however, is that Moore received a guitar without a name. When the Nocaster was originally introduced in 1950, it was called the Broadcaster, a play on the term "broadcast radio," which was the media giant at the time. After a few months of production, however, Fender received a telegram from fellow instrument manufacturing company Gretsch. The message notified the guitar company of its potential copyright infringement on Gretsch's trademarked Broadkaster drum series, forcing the guitar-maker to change the name. Fender instructed factory workers to snip the word "Broadcaster" off the guitar's decal, and it wasn't long before the employees started referring to it as the "Nocaster." Weeks later, the model was renamed the Telecaster after the new up-and-coming media format, television, but the Nocaster name has stuck as an amusing nod to Fender's first days. Over 300 classic American acoustic and electric instruments. Over 30 Gibson Sunburst Les Pau l guitars from 1958 through 1960, considered the holy grail of electric guitars and a pricetag to prove it. Over 75 custom-color Gibson Firebird guitars, even rarer than custom-color Fenders. Prototype guitar models by Fender, Gibson and Gretsch.